SATURDAY APRIL 6TH - 8:30 AM - 4:30 PM. This line from a poem by Franz Wright serves to focus this day of silent prayer, lecture, and discussion. Silence has no opposite. For the silent mind, sound is as silent as no sound. For the mind free of clutter, the silence of despair and the silence of joy are different manifestations of the very same silence. But for the cluttered mind, such things seem to be at odds. To explore this, among other things, Fr. Martin will consider such topics as: the inner noise generated when we try to use contemplative practice to acquire something we think we lack (such as perpetual peace); or get rid of something we would rather not face; how the practice of awareness can establish us as our own contemplative project; as well as some special challenges for the maturing contemplative. Father Martin Laird is a member of the Order of St. Augustine and Professor of Early Christian Studies at Villanova University. His scholarship is on the Church Fathers, especially Evagrius Ponticus. He has extensive training in contemplative disciplines, gives retreats, and has lectured extensively on contemplative prayer throughout the United States, Great Britain, and Ireland. He teaches the ancient Christian spiritual practice of contemplation-clearing away distractions to become aware of silent union with God. He is the author of a host of articles and books including Into the Silent Land and A Sunlit Absence: Silence, Awareness, and Contemplation. 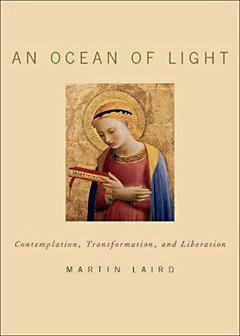 He recently published An Ocean of Light: Contemplation, Transformation, and Liberation, (book-cover above) all compelling works for those interested in contemplative prayer. (from Oxford University Press). He draws on the ancient wisdom of both the Christian East and West as well as on contemporary literature. In 2014, and again in 2016, Father Martin gave lectures on "The Practice of Contemplative Prayer" here at the monastery. This "Contemplative Day of Retreat" is designed with those original attendees in mind. This is not for beginners but is geared toward the mid-level practitioner of prayer. We would assume that you have done some spiritual readings on prayer and have attained some familiarity with the contemplative journey through your spiritual reading, practice, and a discipline of prayer. Fr. Martin Laird plans to present a full day of Contemplative Retreat that includes two conferences interspersed with Prayer, Silence and Community Sharing. This is a small gathering with limited seating which filled up quickly. REGISTRATION IS CLOSED. The offering of $75.00 includes refreshments and a light lunch. "Day 2" Sunday, Seats are AVAILABLE. We pray for your continual growth on the path to contemplation.